Adrian likely flourished in the early fifth century. His sole-surviving work is the Introduction to the Divine Scriptures, a Greek treatise that today survives in two recensions. The central topic of the Introduction is the Septuagint's odd stylistic features. 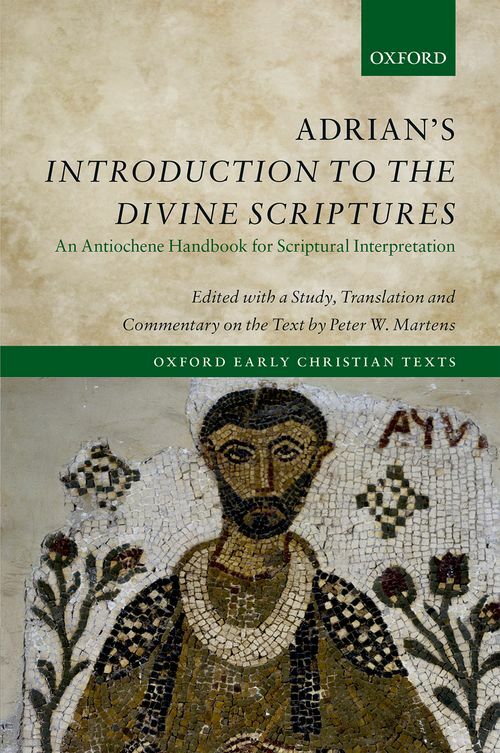 In the first section Adrian catalogs the anthropomorphic ways in which God is portrayed in Scripture (the Psalms in particular) and then explains how such expressions ought to be understood. The second section on diction identifies peculiar word usages, offers lexicographical analyses of semantically rich terms, and discusses a handful of tropes. The third section on word arrangement contains a short list of figures of speech. The treatise concludes with a series of appendices: a catalog of twenty-two tropes, defined and illustrated from Scripture, a two-fold classification of Scripture into prophetic and narratival literature, an extended excursus on how teachers should instruct beginners in scriptural interpretation, and, finally, another classification of Scripture into prose and poetry. The Introduction contains striking verbal and thematic affinities with the exegetical writings Theodore of Mopsuestia (ca. 350-428). This treatise also occupies a unique place in Antiochene scholarship: it is the only surviving handbook on scriptural interpretation from the leading fourth and fifth century figures of this tradition and succinctly codifies many of its guiding principles for scriptural exegesis. This volume offers the first critical edition of the Introduction (its two surviving recensions and the fragments from the exegetical catenae); the first English translation of the treatise, which is also richly annotated with explanatory commentary; a substantial prefatory study that orients readers to Adrian and a number of the important features of his work. Peter W. Martens is Associate Professor of Early Christianity and Chair of the Department of Theological Studies at Saint Louis University. Prior to arriving in St. Louis he taught at the University of Notre Dame and Yale Divinity School. He specializes in Origen and his legacy, and has wide-ranging interests in the history of biblical interpretation. His previous publications include Origen and Scripture: The Contours of the Exegetical Life (OUP, 2012).